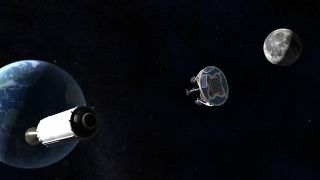 Artist's illustration of SpaceIL’s lunar lander after it has separated from its Falcon 9 rocket. The private race to the moon is really starting to heat up. A team from Israel called SpaceIL has signed a contract to launch its robotic lunar lander toward the moon aboard a SpaceX Falcon 9 rocket in the second half of 2017. SpaceIL is therefore a strong contender to win the $20 million top prize in the Google Lunar X Prize (GLXP), contest organizers said. "The magnitude of this achievement cannot be overstated, representing an unprecedented and monumental commitment for a privately funded organization, and kicks off an exciting phase of the competition in which the other 15 teams now have until the end of 2016 to produce their own verified launch contracts," Weiss added. "It gives all of us at X Prize and Google the great pride to say, 'The new space race is on!'" Artist's illustration of SpaceIL's newly designed robotic lander on the moon. SpaceIL is not the only GLXP team with firm plans to head to the moon. For example, California-based Moon Express announced its own launch deal with the spaceflight company Rocket Lab last week, and Pittsburgh-based Astrobotic signed a contract with SpaceX back in 2011. Moon Express aims to launch its robotic MX-1 lander to the moon for the first time in 2017, while Astrobotic team members have said they plan to loft their Griffin lander atop a SpaceX Falcon 9 rocket sometime next year. But SpaceIL is the only team so far to initiate the verification process, in which contest organizers review and assess the launch contract and supporting documents, X Prize representatives told Space.com. This milestone is a big deal: At least one GLXP team had to announce a verified launch contract by the end of 2015 for the competition to be extended through Dec. 31, 2017. The Google Lunar X Prize was created in 2007 to encourage the development of the private spaceflight industry, and hopefully help usher in a new era of affordable access to the moon and other space destinations. The first privately funded team to successfully land a robotic craft on the moon, have the lander move at least 1,650 feet (500 meters), and beam high-definition video and photos back to Earth by the end of 2017 will win the $20 million grand prize. The second team to accomplish these goals will get $5 million; another $5 million is set aside for other milestones, bringing the total purse to $30 million. Sixteen teams remain in the competition. Image detailing the different systems and components of SpaceIL's robotic lunar lander, which weighs 1,100 lbs. (500 kilograms) and measures 5 feet high by 6.6 feet wide (1.5 by 2 meters). SpaceIL signed its launch deal with Seattle-based Spaceflight Industries, which recently purchased a Falcon 9 launch from SpaceX. (Falcon 9 flights currently sell for about $60 million.) SpaceIL's lunar lander will get a "co-lead spot" on the launch, sitting inside a capsule among a number of secondary payloads, GLXP representatives said. SpaceIL team members announced the contract today (Oct. 7) at a press conference in Jerusalem, Israel, during which they also revealed the new design of their 1,100-lb. (500 kilograms) lander, which is about 5 feet high by 6.6 feet wide (1.5 by 2 m). "Last year, we made significant strides toward landing on the moon, both in terms of project financing and in terms of the engineering design, and now, we are thrilled to finally secure our launch agreement," SpaceIL CEO Eran Privman said in the same statement. "This takes us one huge step closer to realize our vision of recreating an 'Apollo effect' in Israel: to inspire a new generation to pursue science, engineering, technology and math." To date, only three entities have succeeded in soft-landing a spacecraft on the lunar surface — the governments of the United States, the former Soviet Union and China.